Finance Finesse: Find the perfect financing fit you’re comfortable with through a wide range of various banks that meet all credit needs. Want warranty, GAP, or added aftermarket parts & upgrades? Pick our brain until you know all of the ins and outs. We accept all trades, you name it, we’ll buy it! Use our TradePending tool to find out the market value of your trade. Had a great experience in the service department today! Went in because I had a nail in one of my tires. Addison Dunn went above and beyond to get me taken care of, the tire replaced, and had me back on the road quickly! Good to know that they back up their vehicle sales with great service! We will be the first choice of all our community members (near and far) for all their transportation ownership needs. Generations of families will fulfill their transportation needs through our dealerships. Customers and community members will recommend our services to everyone they know. We will be an important part of our communities by ensuring our organization is sustainable. Established in 2001 and owned by Gaines and Vickie Stanley. 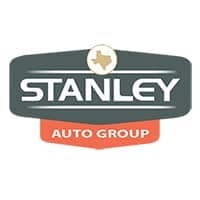 Stanley Auto Group is one of the largest privately owned dealership groups in the state of Texas. It is a Texas leader in automotive retailing and proudly serves its communities with 16 hometown dealerships providing sales, service, parts and collision services. The Stanley families of franchised dealerships are 100% domestic and include the brands of Ford, Lincoln, Mercury, Chevrolet, Buick, GMC, Dodge, Chrysler and Jeep. Stanley Auto Group	, .